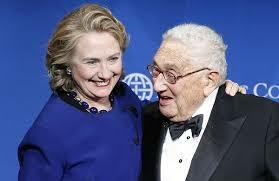 HILLARY CLINTON’S CAMPAIGN has been seeking the endorsement of former Secretary of State Henry Kissinger, and their efforts may pay off, as there are reports that he is expected soon, alongside former Secretary of State George Schultz, to issue a joint endorsement of Clinton. While those inside the national security community in Washington, D.C., may applaud the endorsement, Kissinger’s legacy of war crimes — from complicity in the 1973 coup in Chile to spearheading the saturation bombing of Indochina — has made him far less popular among human rights observers. Clinton is well aware of that legacy. As secretary of state, she traveled to areas of the world that were devastated by policies Kissinger crafted and implemented.